Whitby Town were held to a 1-1 draw by fellow Evo-Stik Premier Division strugglers Grantham on Saturday. Three points from their clash with the Gingerbreads would have seen the Seasiders escape the relegation places on goal difference, however a disappointing second-half performance allowed the visitors to claim a share of the spoils. Darren Williams handed a first start to former Middlesbrough and Hartlepool man Ryan Brobbel, and the attacking midfielder impressed, particularly in the first period. Brobbel combined nicely with Mikey Roberts on a number of occasions, most notably in the 31st minute when Roberts set up the Blues’ number 10 to slide the ball past Jake Turner and put Town 1-0 up. Williams’ men were good value for their lead heading into the interval, but they were caught sleeping just a couple of minutes after the resumption and Greg Smith was afforded time and space to fire home at the back post for 1-1. 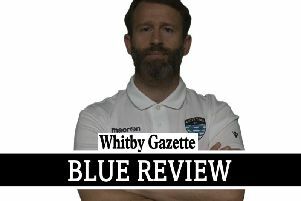 As Grantham grew into the match and the game began to open up, the visitors looked more and more of a threat, and Whitby were indebted to goalkeeper Shane Bland who made a number of important saves. The Blues created enough chances of their own to win the game in the second period despite never really hitting top gear. Roberts failed to find the back of the net when well placed on a couple of occasions before Callum Martin took advantage of a defensive slip and burst through on goal in the closing stages, only to send his shot just over Turner’s crossbar. With almost the last kick of the game, Dave McTiernan had a great opportunity to seal all three points but was denied by a fine stop from Grantham’s gloveman. Full match report, reaction and more of Brian Murfield’s pictures in Friday’s Gazette.